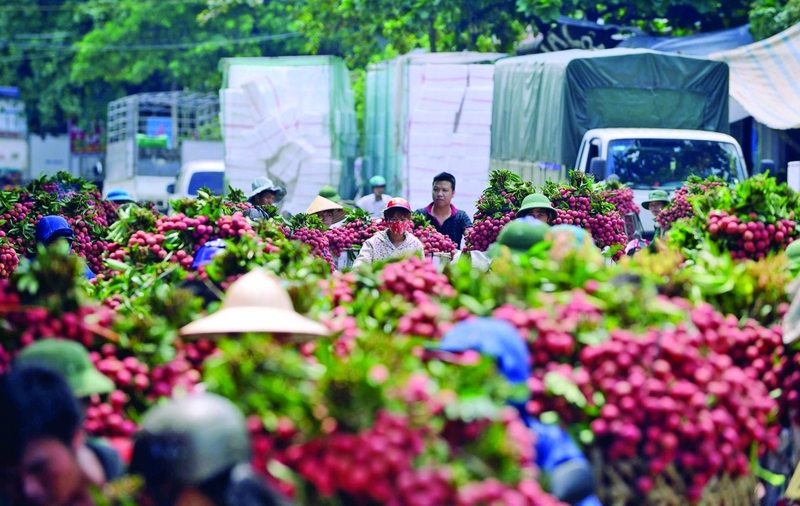 (VEN) - Due to favorable weather conditions this year, the northern province of Hai Duong expects a bumper crop of Thanh Ha litchis, a famous specialty of the locality. Along with promoting production, local farmers are boosting domestic sales and exports. The National Office of Intellectual Property of Vietnam (NoIP) under the Ministry of Science and Technology certified the geographical indication for Hai Duong’s Thanh Ha litchis in 2017. According to the Hai Duong Department of Agriculture and Rural Development, in 2018, litchi-growing areas in the province are looking forward to the most abundant harvest of the past five years. According to Deputy Director of the Hai Duong Department of Agriculture and Rural Development, Vu Thi Ha, the province has 10,500ha of litchis for the 2018 crop, with total output expected to reach 55,000-60,000 tonnes. Litchi growing is concentrated in Thanh Ha District and Chi Linh Town. Local farmers will harvest litchis in May and June, Ha said. The provincial communist party committee and people’s committee have asked the Hai Duong Department of Agriculture and Rural Development, Thanh Ha District and Chi Linh Town to provide guidance for promoting litchi production and sales. Farmers have been trained in preventing diseases affecting litchis to ensure quality and output. They have also been trained to grow litchis on 8,000ha according to the VietGAP process to ensure food hygiene, safety and traceability for 35,000 tonnes of the fruit. Local farmers have received VietGAP certifications for 300ha of litchis and production unit codes for 13 growing areas covering 131ha, with 2018 output expected to exceed 3,500 tonnes. Litchis grown in these areas are eligible for export to discerning markets, such as the US, Australia and the EU. “In 2017, Hai Duong had 187ha of litchi-growing areas meeting VietGAP standards with output of 1,500 tonnes; 88.54ha were granted production unit codes, yielding about 1,000 tonnes of eligible fruit for export,” Ha added. Thanh Ha District People’s Committee Chairman Nguyen Van Luc said, along with promoting exports to traditional markets, local businesses are paying special attention to boosting domestic sales and striving to conquer discerning markets. 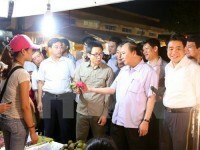 According to Vu Thi Kim Phuong, Deputy Director of the Hai Duong Department of Industry and Trade, the department recently appealed to counterparts in other provinces and cities, as well as other departments and sectors in Hai Duong, supermarkets, trade centers and business associations, seeking joint efforts to boost litchi sales. Hai Duong plans to organize a litchi and farm produce festival in late May to promote this local specialty among consumers and foreign tourists nationwide. Hai Duong Province People’s Committee Vice Chairman Nguyen Anh Cuong said the province would financially assist litchi export activities. However, the export volume remains limited due to high irradiation and transportation costs. The province needs help from scientists to improve litchi preservation and thereby increase the export volume. Vietnam exports fresh litchis to various markets, including discerning markets, such as the US, the EU, Japan, the Republic of Korea and Australia. Chairman of the Board and General Director of the Dong Giao Foodstuff Export Joint Stock Company (Doveco), Dinh Quang Khue, said, Japan wants to buy Vietnamese litchis all year round, requiring appropriate storage facilities. Doveco recently opened a state-of-the-art processing plant in Bac Giang Province, enabling the company to export high volumes of both fresh and frozen fruit. The company is capable of exporting 5,000 tonnes of processed litchis and large volumes of fresh litchis and longans. Khue requested the Ministry of Agriculture and Rural Development to create favorable conditions for domestic businesses to participate in fairs abroad to promote exports of the fruit, especially to Japan, the US and Dubai. Tran Van Cong, Deputy Director of the Agro Processing and Market Development Authority, said his office has worked with trade promotion centers, major litchi and longan production areas and distribution centers to set up linkages for domestic sales promotion. Supermarkets have been identified as a major channel of domestic sales. Tran Van Cong, Deputy Director of the Agro Processing and Market Development Authority: Vietnam has been licensed to export litchi and longan via official trade channels to China. The Ministry of Agriculture and Rural Development will negotiate with Australia to promote longan exports to this market, too.